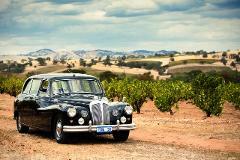 Enjoy a private tour of the beautiful Barossa Valley wine region in a classic 1962 Daimler. Includes a 2 course lunch with wine at Vintners Restaurant, afternoon tea at Maggie Beers Farm Shop, tailored wine tastings & entrance fees. This Ultimate Tour in a 1962 Daimler includes a wine-making experience at Penfolds plus a Grange tasting, lunch at Vintners Restaurant, Maggie Beers, VIP Torbreck tasting, and taste your birth year and 100 year old Tawny at Seppeltsfield. 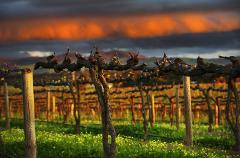 Enjoy a private tour of the beautiful Barossa Valley wine region in a modern 7 seat Mercedes Viano. Includes a shared gourmet platter lunch at a local winery, afternoon tea at Maggie Beers Farm Shop, tailored wine tastings & entrance fees. Experience a Barossa Full Day Tour in a classic 1962 Daimler including 2 course restaurant lunch and a/tea at Maggie Beers. Includes 2 nights accommodation at the Barossa Novotel Resort with cooked breakfast daily at Harry's Restaurant.